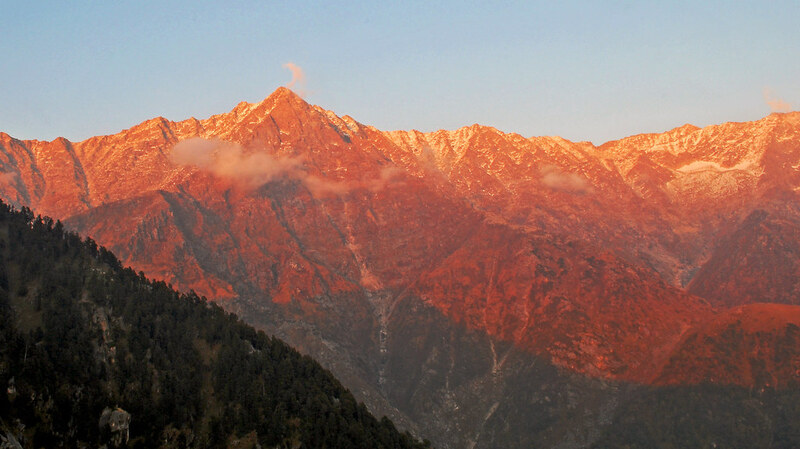 The Sun was going down, stealthily, in a slow motion dive behind the Dhauladhars. Everything was strangely lit in orange, including the towering pine that stands right in the centre of the town square at McLeodganj. I was sitting at the terrace, watching it go down; content in those moments. In the backdrop, there was a suddenly rising mountain, its peak glistening with white, freshly fallen snow. I was startled when I saw it for the first time. A presence so strange that its impression is starkly clear in my mind, even after all these months. As the first stars appeared in the sky above, I clutched the shawl tighter around my shoulders and started down the road. A certain nip in the air couldn’t dampen my spirits, for I’m a winter child. After a walk up to Dharamkot and back, I was more than just hungry. Starving is the right word. Maybe, McLlo‘s mashed potatoes again. 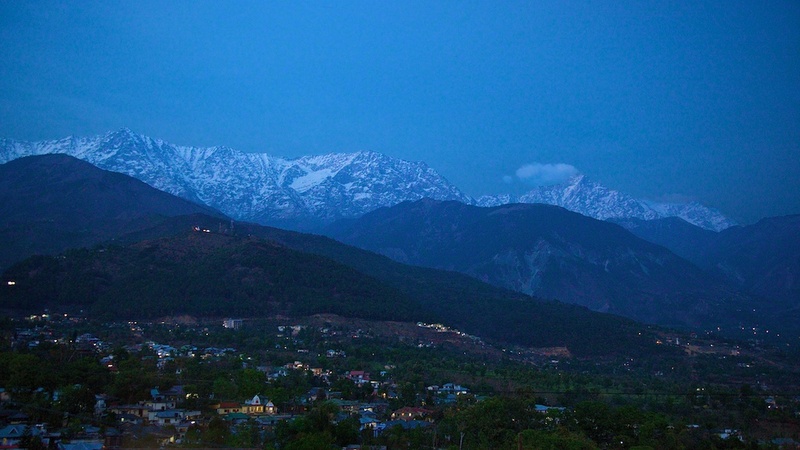 By the time I neared the more habitable parts of the town, tiny lights had come popping up at Dharamsala. A rosy-cheeked, Tibetan child smiled at me, a toothless one at that; while Hey Jude came streaming from some club up on the upper road. Just as I was about to turn to the stairs that lead to McLlo, I noticed the lady standing under the red billboard that spelt Tibet Kitchen. An alluring smell came with the steam from the pressure cooker that was going full piping beside her. Ah, so that was the momos lady everyone had told me about. The hotel cook considered her some god, for in his words, she makes the “tastiest momos” in the world. Ravenously hungry as I was, half a plate of those wouldn’t hurt me (that’s the talk that was doing the rounds in my head). To confess, I had never liked momos before that evening. Those dumplings resemble chicken in some way which I’ve not been able to comprehend till now. Still, the lure was too much. So, I went up to her. She looked up at me, laughter dancing in her eyes. Just like those fairy godmothers you see in animated movies. With one sweep of her hand, she got me a chair. All this before I could ask her for a plate, which came too, in some seconds. 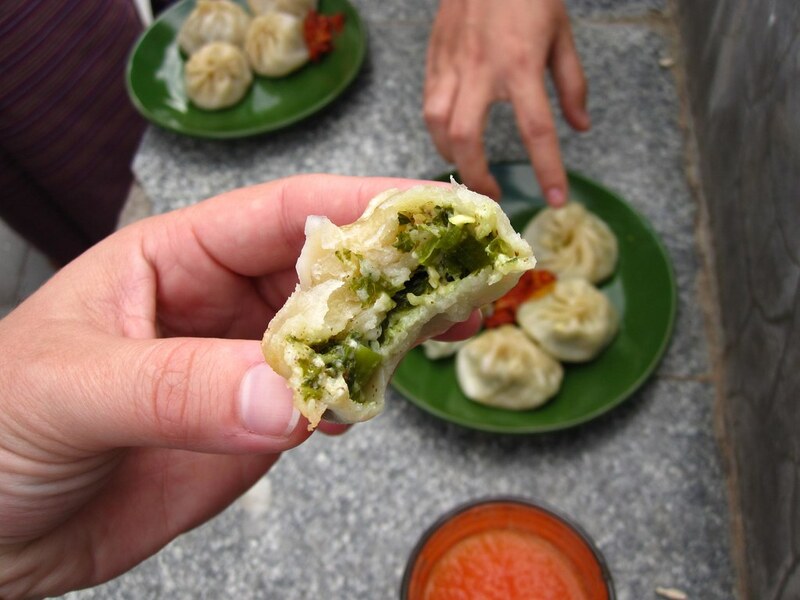 It tasted like something other than those raw-looking dumplings that people down in the cities refer to as momos. They were like little packets of wonder – melting in mouth, filled with potatoes that somehow crunched. That was when I discovered the term ‘delectable’. I had walked up to her to get one plate at maximum, only to end up gobbling down two. She chatted all this while, in what perhaps was Tibetan. I replied in a mumbo jumbo of Hindi, English, and some words that I had picked from my hotel’s staff. Like Tashi Delek. We sat like old friends, while the whole town buzzed around us. Vendors selling those very cute woollen caps that have little tails, mittens, shoes made out of wool and more. If not for the age difference, we could’ve have passed for a bunch of giggly school girls. The only thing that didn’t go right that day was she declined to charge me for the momos. Two plates at that. Every time I tried convincing her, she would bow and smile. At around 7, she packed up her little kitchen, gave me a hug and left. I watched her going down the road; a petite figure, with her shoulders hunched over, trotting at a pace that seemed more like a gentle tumble. With a sigh, I came back to my room. It was one of the most memorable dinners I’ve ever had in my travels. Maybe, I’ll see her again someday soon. And I know she’s elusive. You’ll find her only with some stroke of luck. So look closely around the main square. She’ll be over there, if you see a trail of steam shooting up from some corner. That’s what travel does to you. It turns you human, makes you notice people who you might pass in the rush of city life, makes you know that friends walk in, uninvited. Often staying as some figments of imagination, buried deep in memory. Deep but never forgotten. The Beer Effect At McLeodganj. Yes Dave. You can check out the recipe here http://www.sanjeevkapoor.com/vegetable-momos.aspx. This is the best one I could fine, since I, myself, am a bad cook. There’s a recipe for non vegetarian momos too, you can check that here http://www.sanjeevkapoor.com/chicken-momos.aspx. These are written by India’s best chef. Hope these help. Shikha….. Is there a recipe for the Momos? I would like to try making them as they look so delicious. Thank you planētēs astēr. Travelling indeed is a great experience, every part of it leaves you richer.